Directed by Academy Award winner Steven Spielberg, Jaws set the standard for edge-of-your seat suspense quickly becoming a cultural phenomenon and forever changing the movie industry. When the seaside community of Amity finds itself under attack by a dangerous great white shark, the town's chief of police (Roy Scheider), a young marine biologist (Richard Dreyfuss) and a grizzled shark hunter (Robert Shaw) embark on a desperate quest to ..
Triple-bill of the sequels to the 1975 feature 'Jaws'. In 'Jaws 2' (1978), four years on from the horrible shark attacks which plagued Amity Island, Police Chief Brody (Roy Scheider) is still uneasy about the prospect of another shark visiting the bay. When the film developed from the camera of a missing diver shows what looks like a shark fin, he begins to get worried, but Mayor Larry Vaughn (Murray Hamilton) again plays down the incid.. The horror is far from over as Roy Scheider, Lorraine Gary and Murray Hamilton reprise their iconic roles in Jaws 2. Four years after the great white shark terrorized the small resort of Amity, unsuspecting vacationers begin disappearing in an all-too-familiar fashion. Police Chief Brody (Scheider) finds himself in a race against time when a new shark attacks ten sailboats manned by teenagers, including his own two sons. The same heart-.. The horror is far from over! Four years after the great white shark terrorized the small resort of Amity, unsuspecting vacationers begin disappearing in an all-too-familiar fashion. Only one man knows the truth. Academy Award-winning producer Richard D. Zanuck (Rules of Engagement, Deep Impact) brings the next installment of this frightening series with Roy Scheider reprising his role as Police Chief Brody. Newly remastered, Jaws 2 cont..
Once again the peace of Amity and the lives of the Brody family are shattered by a bloodthirsty shark in Jaws: The Revenge. Lorraine Gary reprises her role as the now widowed Ellen Brody who finds herself reliving the horrors of the past when a mammoth shark kills her son. Grief-stricken, she travels to the Bahamas to be with her other son, a marine biologist (Lance Guest), and his family. There she meets and falls for a carefree airpla.. Directed by Academy Award winner Steven Spielberg, Jaws set the standard for edge-of-your seat suspense, quickly becoming a cultural phenomenon and forever changing the movie industry. When the seaside community of Amity finds itself under attack by a dangerous great white shark, the town's chief of police (Roy Scheider), a young marine biologist (Richard Dreyfuss) and a grizzled shark hunter (Robert Shaw) embark on a desperate quest to..
Own Jaws - Bigger Boat Mug from Deff, DVD, Blu-Ray & 4K Video Specialists - Free UK Delivery..
Own Jaws - Shark Head Mug from Deff, DVD, Blu-Ray & 4K Video Specialists - Free UK Delivery..
Own Jaws 2 - Jaws 2 Poster Mug from Deff, DVD, Blu-Ray & 4K Video Specialists - Free UK Delivery.. The most famous shark of all time is back... bigger and more terrifying than ever in this all new Jaws adventure starring Dennis Quaid and Louis Gossett Jr. Florida's new "Undersea Kingdom" (a maze of underwater plexiglass tunnels) is terrorised by a giant female great white shark, hell-bent on bloodthirsty revenge. Special Features Theatrical Trailer, Jaws 2 Trailer, Jaws, The Revenge Trailer.. This Special Edition is Digitally Mastered and contains exclusive footage, interviews, and behind-the-scenes material. Steven Spielberg directed this classic film that became one of the most enduring action-suspense films of all time. 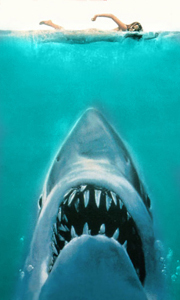 "Jaws" was an instant blockbuster, a phenomenon, and today it is still acclaimed by critics and audiences alike. Rediscover the timeless film that continues to make entire generations afraid to go in the w..